UPDATE (July 19th): We are so appreciative of all of your generosity, helping us reach our goal in just 36 hours! Because of this, we have decided to raise our goal to $18,000. We have been in touch with the Palestinian communities that have supported us and we have stood in solidarity with over the last five days across East Jerusalem and the West Bank and have decided to split all the funds we raise with the communities of Um El khir, Khan El Ahmmar, Youth of Sumud, and Silwan (East Jerusalem). The money we raise will support them in their struggle to stay on their lands, build infrastructure, provide legal support and to raise awareness for their struggle. Birthright refused to show us the Occupation, so we went to go see it for ourselves. Birthright threatened us with a lawsuit as a way of intimidating future participants from demanding answers to their questions about Israel’s military control over the Palestinian people. On Sunday July 15th, 8 of us on two separate Birthright trips in Israel walked off our tour. Watch the livestream from the walk off here. We were invited to meet with the Sumarins, a Palestinian family that has lived in East Jerusalem for over 25 years under the threat of eviction by the Jewish National Fund and Elad, a far-right settler organization. Birthright would not allow us to hear their story so we decided to leave the tour in order to hear it. 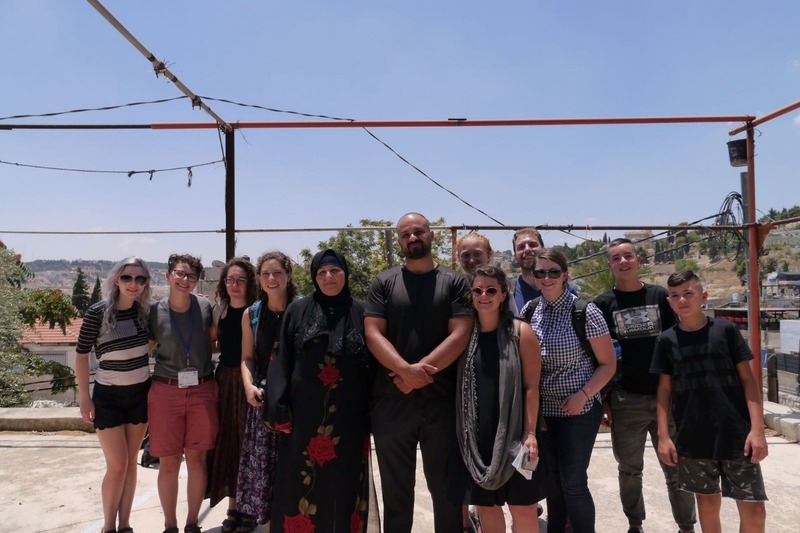 Over the course of the first six days of our trip, we genuinely tried to engage with the program through asking tough questions about the Occupation and demanding a more detailed and accurate picture of the truth. This came to a front on one of our trips on the fourth day of the trip when we asked for a more accurate map of Israel than the one they had handed out to the bus. We asked why the map they had given us neglected to mention the existence of the West Bank. Our tour guide reacted by saying "Israel sees the West Bank as part of Israel..the West Bank is just like Tel Aviv of Jerusalem." He went on to claim that Birthright is curating a very specific truth that they want us to hear, a version of the truth that the Israeli government wants to tell and if we did not like it then we should leave the program and go find another narrative. So this is what we did on Sunday. As young American Jews, we felt compelled to make this simple, moral decision to walk off our trips because of Birthright’s failure to show us the truth about the occupation. Visiting Israel in 2018 and not receiving comprehensive education about the occupation is like visiting the South in the 1950s and not talking about Jim Crow segregation. Young Jews deserve the truth about what’s being done in our name and it is out of touch and absurd that Birthright would try to hide this from us. This is why we left our trip and accepted the invitation from the Sumarin family. As a result of our actions Birthright has taken our trip deposits, canceled our flights home, told us that we will need to be responsible for booking our own flight, and — worst of all — threatened a lawsuit against us. Since leaving our trip we have been visiting various families and communities in East Jerusalem and the West Bank, and learning about their experiences living under military Occupation. We visited the Sumarin family in East Jerusalem; we watched the World Cup finals with other activists at Khan Al-Ahmar, a Bedouin community under immediate threat of demolition, and heard their story; we spent last night in Umm Al-Khair and learned about the three times they’ve had to rebuild their community center and the countless times they’ve had to rebuild their homes. We are so grateful for the immense hospitality these communities have shown us, even while they face the daily nightmare of the Occupation, and will be donating all leftover funds to these communities. We are aware that these communities and all Palestinians living under Occupation are in much more dire need of funds, and we know that allies also need funds in order to take the necessary risks to end the Occupation. Please donate to our fundraiser and show Birthright — and the larger Jewish establishment — that they cannot intimidate our generation from demanding the truth about the occupation. Thank you to everyone who generously contributed to support the eight of us who walked off our Birthright trip. We are all safely home in the United States and feel enormously grateful for the support we received in challenging Birthright and confronting the truth about the occupation. As young American Jews, we felt compelled to make this simple, moral decision to walk off our trips because of Birthright’s failure to show us the truth about the occupation. We could not have taken this risk and returned home safely without the support of each and every one of you. We also couldn’t have done it without the support of IfNotNow, who helped to secure our flights home and arranged for us to meet with Palestinian and Israeli activists fighting the occupation in Israel/Palestine. They are going to withdraw the funds we’ve raised to help us disseminate the money and get it to the Palestinian communities that you all contributed to support. We’re grateful to them and to you in helping us fight the occupation. Thank you!! We are less than $2,000 away from reaching our goal. All remaining funds raised will go to the Palestinian communities that welcomed us and most urgently need resources to fight the daily violence of the occupation. The money we raise will support them in their struggle to stay on their lands, build infrastructure, get legal support, and raise awareness for their struggle. If you feel inspired to share with friends or networks, we encourage you to do so! And again, we can't thank you enough for all your support. We are so appreciative of all of your generosity, helping us reach our goal in just 36 hours! Because of this, we have decided to raise our goal to $18,000. We have been in touch with the Palestinian communities that have supported us and we have stood in solidarity with over the last five days across East Jerusalem and the West Bank and have decided to split all the funds we raise with the communities of Um El khir, Khan El Ahmmar, Youth of Sumud, and Silwan (East Jerusalem). The money we raise will support them in their struggle to stay on their lands, build infrastructure, provide legal support and to raise awareness for their struggle.